It's official! Thanks to you we won best creemee! Ice Cream Returns Saturday, April 15th! 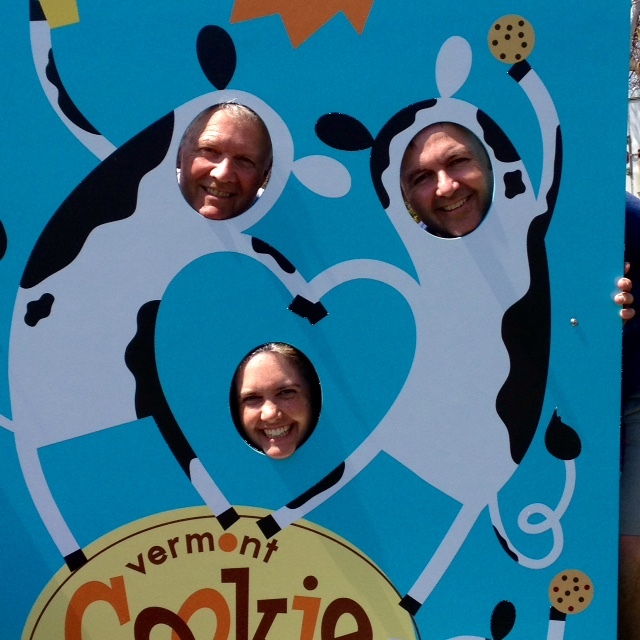 Submit a photo for your chance to win a Vermont Cookie Love Gift Box! Guess who makes solar powered cookies? We do! We've joined a Community Solar Array through SunCommon. We'll be earning solar credits year-round to offset our use of conventionally generated electricity. An estimated 85% of our yearly electric use will powered this way! Since that more than covers the energy used by our Kitchen, we like to think our cookies are now baked completely by the sun. How cool is that? Nothing tastes better than an earth-friendly cookie. Sushmita's coconut macaron's with orange blossom filling. She wins the Holiday Oodles of Love Gift Box. Tammy E's granddaughter ( and Susan Smith's GREAT granddaughter) eying the peanut butter cake (this is seriously cute!) She wins a One Love Gift Box. We did not receive any photos that would fit the "greatest fail" category, so instead we'd like to congratulate one of our favorite's, Sarah H's pink cake pops, with a Chocolate Lovers's Gift Box. We'll also be sending out small prizes to Kristin T, Carlen G, and Catherine for their entries. A big THANK YOU to everyone who participated. We very much enjoyed seeing the pictures of your work. Wish we could give everyone prizes! For the Love of Baking Contest! If you’ve ever bought whole vanilla beans, have a favorite cookie cutter, or worn out a cookie sheet, this contest is for you! We invite you to enter our “For the Love of Baking” contest on Facebook. Simply post a picture of your latest baking exploits on our Facebook timeline and be entered into the running to win some great prizes: a cookie gift basket, a Vermont Cookie Love tee shirts, and more. We'll pick three winners: people's choice, cutest kid, and greatest fail! Can’t wait to see what you’re baking! There's a new Love in town. It's Official: Our Cookies and Dough are Non-GMO! At Vermont Cookie Love we strive to produce the most delicious all natural cookies on the market. We're committed to using high-quality ingredients with no artificial colors, flavors or preservatives. Additionally we work with local Vermont companies whenever possible. We are proud to say that our cookies and dough are officially GMO-free! As a company we're committed to minimizing our environmental footprint and being a positive force in the community and the world. Check out this interview from VPR where owner Paul Seyler talks about the new GMO labeling laws. It's creemee time! We're now open EVERY DAY from 11:00 am to 9:00 pm. Finally, the return of home made whipped cream, cookie crush, real hot fudge, and super yummy ice cream treats. Is that a Cow? Pose with our NEW sign! Summer is here! The creemee window is open and our new face-in-the-hole cow sign is on the front lawn. Stop by and join the fun! The dancing cows were designed by the gals at Gotham City Graphics in Burlington, VT and constructed by Sammel Signs of Essex Junction, VT. Take a picture with three people, or close the little door in the center and pose with two people. There's a bench in the back so little ones can climb up and peek through. Want to share your pics? We'd love to see them, send your snaps to us at: mseyler@vermontcookielove.com. Visit us at the "Big E"
We're pleased to offer cookie dough for school fundraisers, sports teams, and more! We have a nifty little order form that makes it super simple to stay organized, raise money, and make lots of people happy. Who doesn't love cookies? To start fundraising, email us at info@vermontcookielove.com and tell us about your project.